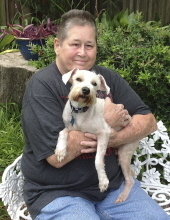 Kay McClellan, of Centerville, Texas, passed away July 30, 2018 in Bryan, Texas at the age of 70 years. Memorial services to celebrate her life are planned for Saturday, September 1, at the Honey J Ranch, 1161 CR 130, Centerville, TX at 10am. Sharon “Kay” McClellan was born August 9, 1947 in Corpus Christi, Texas. Her parents were Cap & Edna “Honey” (Jackson) Smith. She worked as a corrections officer for the Texas Department of Criminal Justice and retired from the Holliday Unit. Kay had moved to Centerville from Pasadena close to twenty years ago. She considered it one of the best decisions she had made and absolutely enjoyed all that “country life” had to offer. Woodworking and riding four wheelers were Kay’s favorite past times, as well as, taking care of her animals. Kay also enjoyed listening to music, especially her two favorite artists, Reba McEntire and Barry Manilow. Kay’s friends and family meant everything to her. She was most happy when they were all together having a good time. Kay was preceded in death by both of her parents, her brother, Wayne “A.W.” Smith and her partner of 21 years, Lucille McLain. She is survived by her brother, Don Smith of Houston; her daughter, Teresa McGrath and husband, Keith Perry, of Centerville; first cousin, Edna Minter Bush; second cousins, Lauri Minter Meeler and Dena Brick and third cousins, Tyler and Zachary Meeler; her best friend Diane Dycus and her partner, Liz Parke, of Mesquite and many more friends and extended family members. Kay is also survived by her puppy dog, Bentley. To send flowers or a remembrance gift to the family of Sharon "Kay" McClellan, please visit our Tribute Store. "Email Address" would like to share the life celebration of Sharon "Kay" McClellan. Click on the "link" to go to share a favorite memory or leave a condolence message for the family.